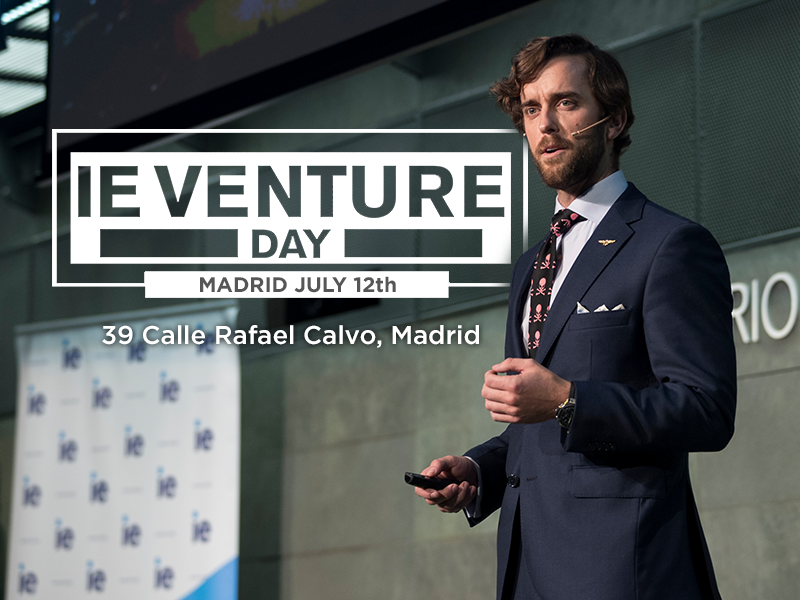 IE Business School - International MBA | Join us for IE Venture Day Madrid on July 12th! Join us for IE Venture Day Madrid on July 12th! All members of the public are welcome! You can register here to attend. IE Venture Days are international events designed to foster the entrepreneurial ecosystem, connecting the best startups, investors, corporations, accelerators and thought-leaders. Every Venture Day lasts between 4-8 hours, and its format is a combination of keynote speakers, panel discussions and a startup competition with the most-promising entrepreneurs of the region. The conferences are open to the general public, and IE students and alumni as well as individuals from the local and regional entrepreneurial communities are invited to participate. Every year Madrid hosts two Venture Days with more than 500 attendants, which celebrates the winners of our Venture Lab Accelerator program. Come and celebrate with us as we showcase the best Startups of IE Business School and IE University during an evening of music, speakers, and pitches and awards. Venture Day Madrid is on Thursday, July 12th, at the Auditorium of the Fundación Rafael de Pino. We will open the doors at 3pm! Our Keynote Speaker is Ikhlaq Sidhu, Chief Scientist and Founding Director, Sutarja Center for Entrepreneurship & Technology at UC Berkeley. Prof. Sidhu will talk about “Artificial Intelligence, Data & Ventures”. After a series of elevator pitches, Prof. Sidhu will continue with “The Data X Workshop”. A little after 5pm, more exciting elevator pitches will follow the Data X Workshop and then we will have an indepth Fireside Chat with IE Alumni Entrepeneurs:“Entrepreneurship after IE” where we will hear from startup cofounders who are creating and who have created startups from early stage all the way to exit. Finally, at 6:30pm Venture Day’s Finalist Competition will begin! We will have 11 finalists from teams who are currently in IE Business School’s IMBA, IE HST’s Master in Big Data and Business Analytics and IE University’s Bachelor’s in Business Administration. This year we have startups who are tackling problems in the realm of cryptocurrencies, artificial intelligence, healthcare, ecommerce, law, energy, fashion and data. It gives us great pleasure to announce to you the next Venture Day finalists and invite you to our next Venture Day in Madrid next Thursday, July 12th at 3pm in the Rafael del Pino Auditorium. Over 50 startups from current students and alumni competed to be finalists at Venture Day and the innovative candidates made the selection a huge challenge. We will have 11 finalists from teams who are currently in IE Business School’s IMBA, IE HST’s Master in Big Data and Business Analytics, IE University’s Bachelor’s in Business Administration and an alumni team that graduated from IE Law School. Our celebration next Thursday July 12th will clearly be a tribute to how our #IESpirit of Entrepreneurship runs far and wide across our programs. We have an afternoon planned that focuses first on Artificial Intelligence, Data and Ventures! Our Keynote, Ikhlaq Sidhu, is Chief Scientist and Founding Director, Sutarja Center for Entrepreneurship & Technology at UC Berkeley. It is a fitting topic considering that we have not one but THREE finalists from IE HST’s Master in Big Data and Business Analytics. This year we have startups who are tackling problems in the realm of cryptocurrencies, artificial intelligence, healthcare, ecommerce, law, energy, fashion and data. The spirit and passion of all of our teams from all programs have been off the charts. Students from the IE Entrepreneurship Club will be actively involved in Venture Day presenting the pitches and moderating the interventions. They will moderate a Fireside Chat with IE Alumni Entrepreneurs: “Entrepreneurship after IE” where we will hear from startup cofounders who are creating and who have created startups from early stage all the way to exit.